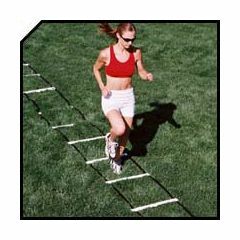 This Plastic Flat Rung Agility Ladder has 15 foot attachable sections with adjustable rungs so that you can customize the length between them. This economic agility ladder can be used for a variety of drills and warm-up activities to improve your agility, coordination, foot speed and balance. Great for indoor or outdoor use. Sides are made of durable cloth and rungs are made of durable plastic. Due to lead time, please allow up to 7 - 10 business days for your delivery.